Learning is something we all do personally, more or less effectively. It’s when we work in groups, in organisations, in programmes and projects that we fail at learning and sharing what we know more often than we succeed. And it’s a problem that has been written about for as long as you care to look back, in Business, in Government, in International Development. The Bill & Melinda Gates Foundation Water, Sanitation and Hygiene (WSH) team recently met to review the progress and outcomes of an 18-month long project that explored how to improve Knowledge Management within the Building Demand for Sanitation portfolio of grants. At the end of a two day process the team committed themselves to a series of actions aimed at improving the way that they do their work of listening, discussing, reflecting on and sharing what they and their grantees are learning from the large and strategic investments made by the Foundation. 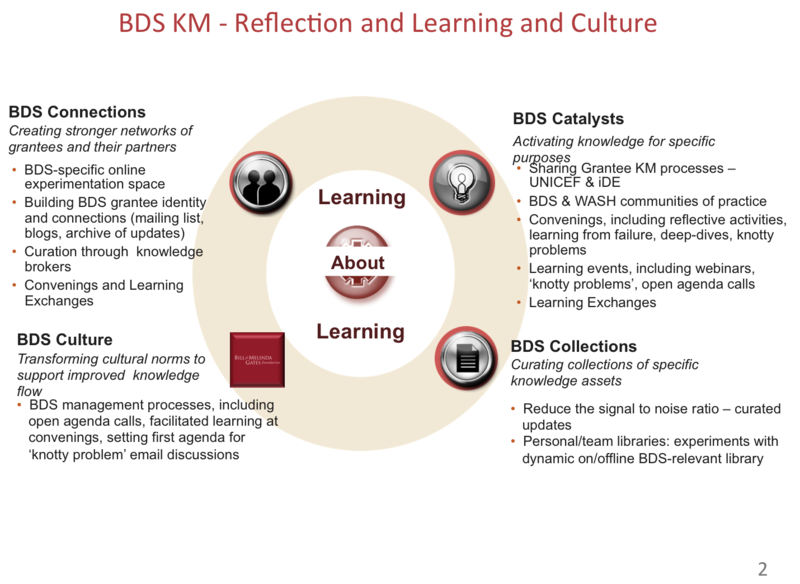 The term Knowledge Management has always been contested: “you can't manage knowledge — nobody can. What you can do is to manage the environment in which knowledge can be created, discovered, captured, shared, distilled, validated, transferred, adopted, adapted and applied”3. This quote from the venerable Chris Collinson gives a sense of the range of activities that need to be considered in thinking about KM. 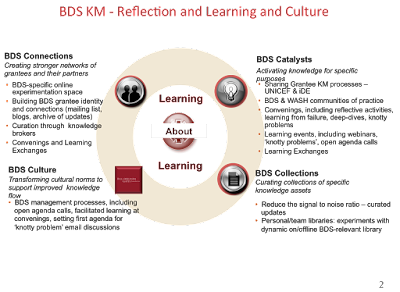 (Note: Collinson is now working with DfID on improving its KM, following the Amber/Red 2014 assessment of it’s organisational learning by the UK’s Independent Commission for Aid Impact (ICAI) in 2014. 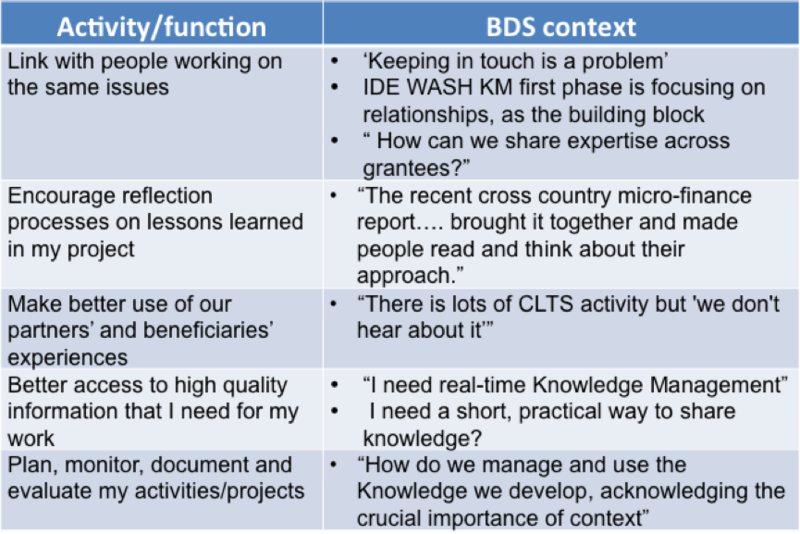 DfID is not alone: interest in and a determination to improve Knowledge Management is sadly something that ebbs and flows in a regular cycle in most large organisations). Learning processes: both individual and collective or social, focusing less on the “sending” and more on the “receiving”, particularly the processes of sense making, understanding, and being able to act upon the information available. 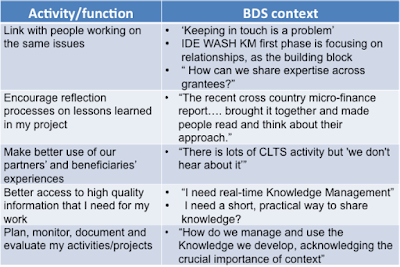 Rather than take a pre-formed template or follow one of the countless KM models we set up a process to engage grantees in a collective project design process. A preparatory survey confirmed that reliable, affordable Internet access remains a problem outside larger, well-resourced organisations for many people across the globe. Once upon a time the introduction of email and other Internet services to Development organisations was seen as a wonderful advance. Today people battle, complaining loudly, with unmanageable inboxes. Meanwhile, the range of information sources continues to multiply exponentially. So grantees were keen that the project explore ways to address the problem. Having synthesised the inception workshop output we discussed the ideas and recommendations with the WSH team in Seattle, seeking also to learn about integrate the project with related Foundation initiatives. The Knowledge Flow initiative was a set of activities investigating and aiming to improve the flow of knowledge within the Gates Foundation. Their simple and elegant conceptualisation of the work provided a framework that mapped onto our emerging proposals (illustrated below) and, we hoped, would enable us to develop our work in alignment with thinking in the Gates Foundation. In the following blogs we will discuss the main activity streams in turn, turning next to a discussion about KM leadership. Good initiative to tell the narrative. Let me read the next blog.